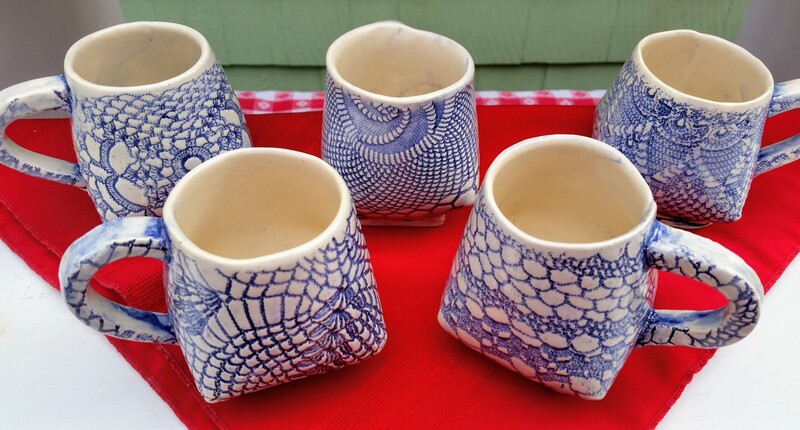 Fat Robin Pottery | Celebrating and honoring lace traditions through clay! 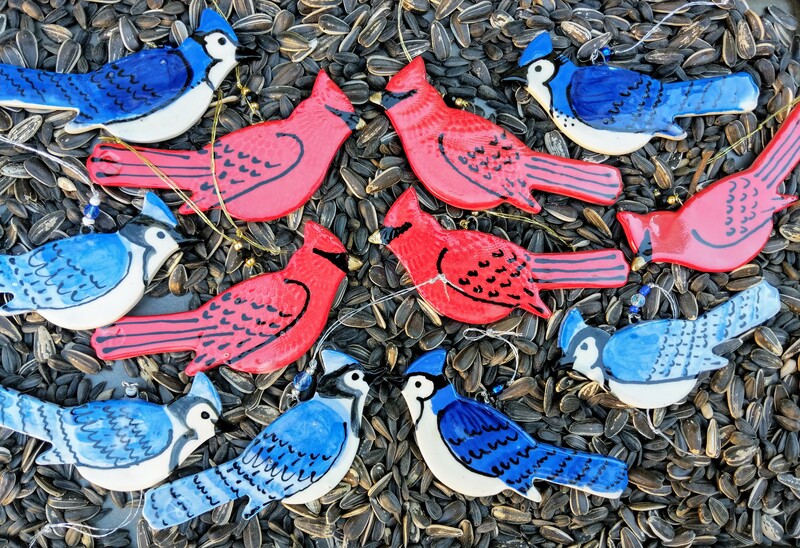 Common birds at my backyard feeder called to me and I made cardinal, blue jay, chickadee and hummingbird ornaments to celebrate everyone’s back yard! 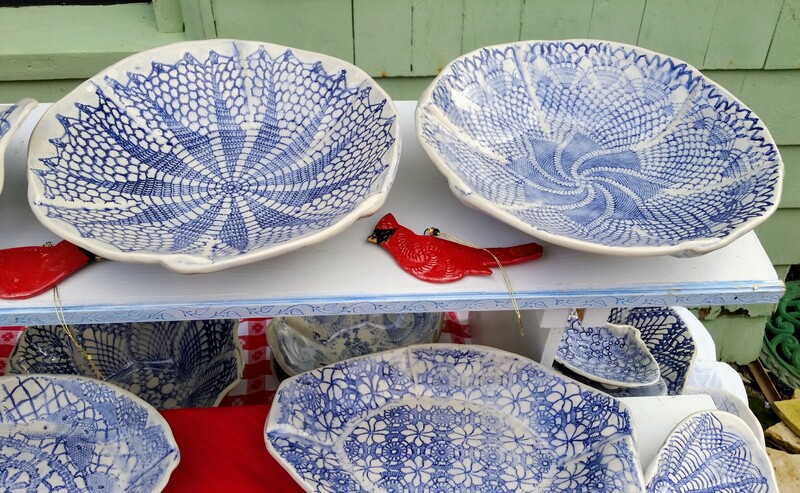 My lace inspired bowls, trays, and mugs are selling well, but this year’s favorites are the ornaments! Bestseller is the cardinal, which for many people, bring back fond memories of departed loved ones, or, for some, when a cardinal appears, it’s a visitor from heaven. Enjoy decorating your tree with all your memories! And if you need a few more memory makers, I am open every day—call/email/text to make an appointment. 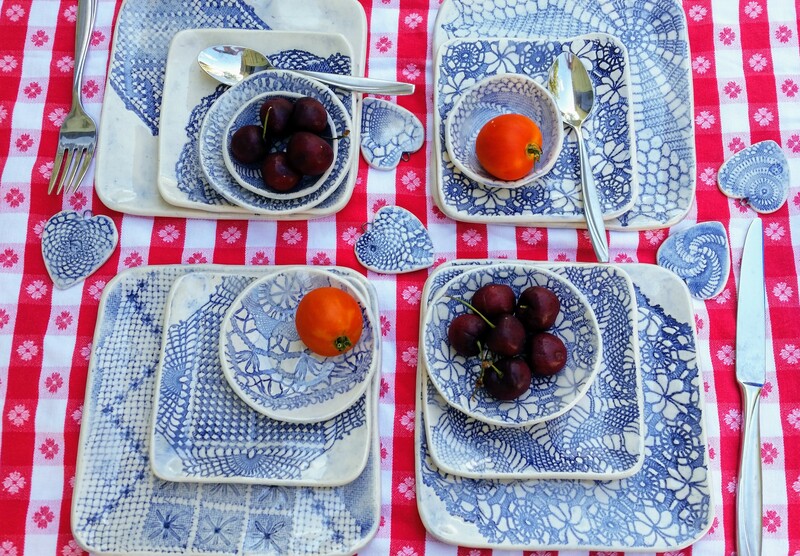 Fat Robin inventory is increasing day by day as vintage lace is impressed into clay slabs and formed into bowls, trays, ornaments, mugs, and more! 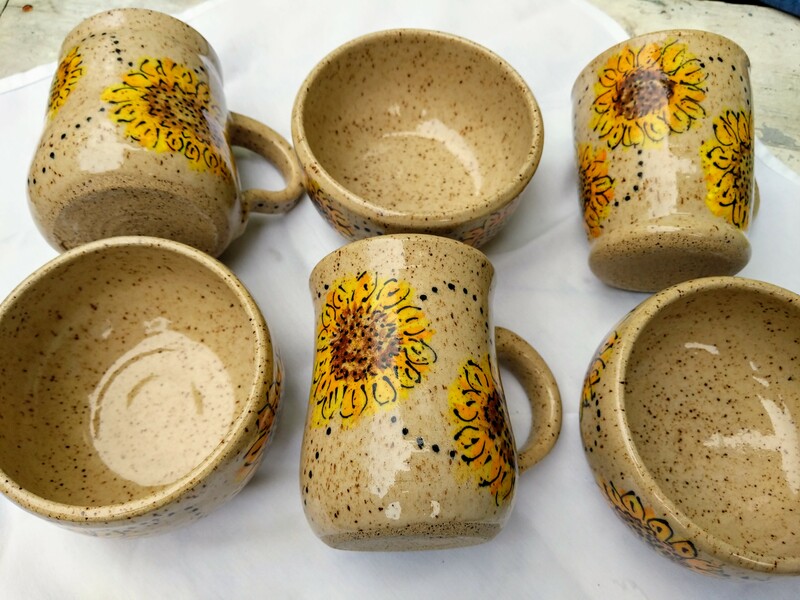 Sgrafitto mugs are appearing and bright sunflowers are poking out of mugs and bowls… the kiln is busy, ornaments are getting beaded and strung, and the last thought at bedtime before I switch my brain off (ha!) is, what’s next! Unique Boutique Artisan Fair on November 10 and 11 at Easton’s Beach Rotunda is my first event of the season. I will not be at the Hibernian Sale this year as my daughter is getting married and therefore, my mind and body will not be focusing on clay! 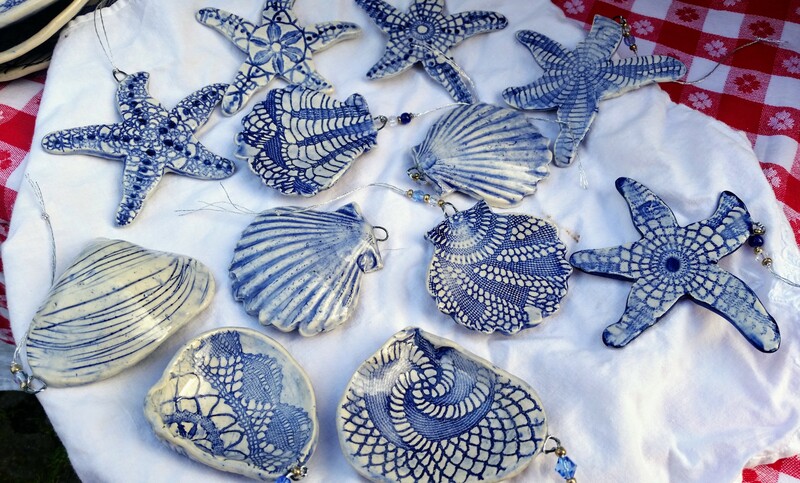 South County Art Association 48th Annual Holiday Fair begins the day after Thanksgiving and includes Fat Robin Pottery, and then I continue to Newport Hospital Auxiliary Fair on Dec. 1 and Newport Art Museum Holiday Sale on Dec. 13 to 15….and perhaps if inventory and energy allow there might be an Open House or another fair….will keep you posted! The crisp fall air beckons and reminds you to get out and enjoy all the fall and holiday festivals, fairs, bazaars, and to support all the artisans behind those vendor tables! If you want to come by and shop Fat Robin Pottery, my garage is my staging area and all my inventory is spread out for you to see. 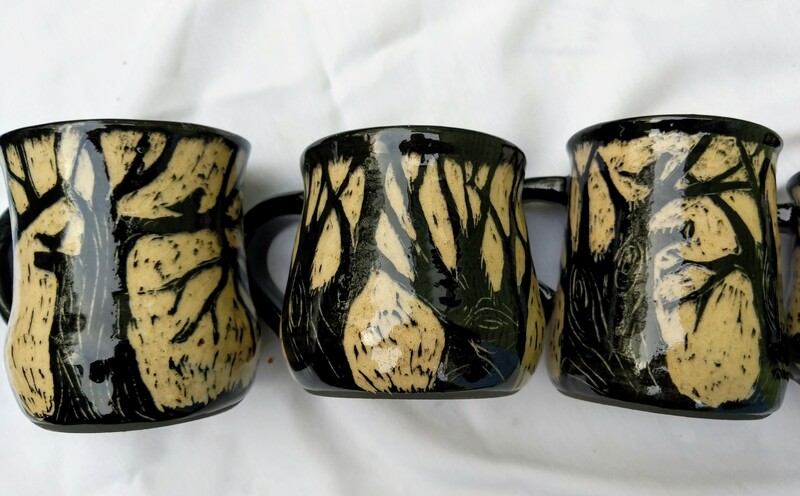 I make a set amount of items, and unfortunately, when they are gone, they are gone….so if a certain mug is calling you, email or call or text to set up a time to come by….and bag it! Have a great happy and sane and thoughtful fall and holiday season 2018! 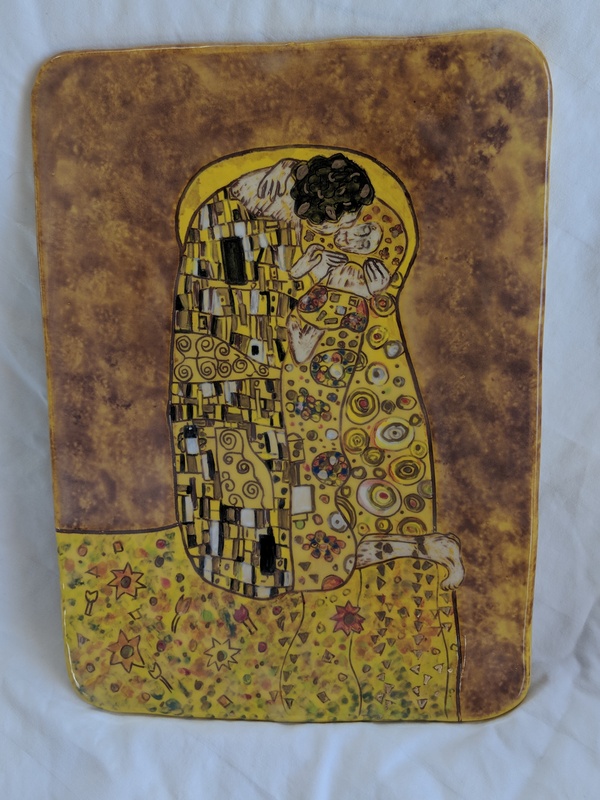 In February each year, Spring Bull Gallery in Newport has their annual Fakes and Forgeries Gallery Show, my favorite….artists submit their interpretation of a well know work of art… my interpretation uses clay as my palette. 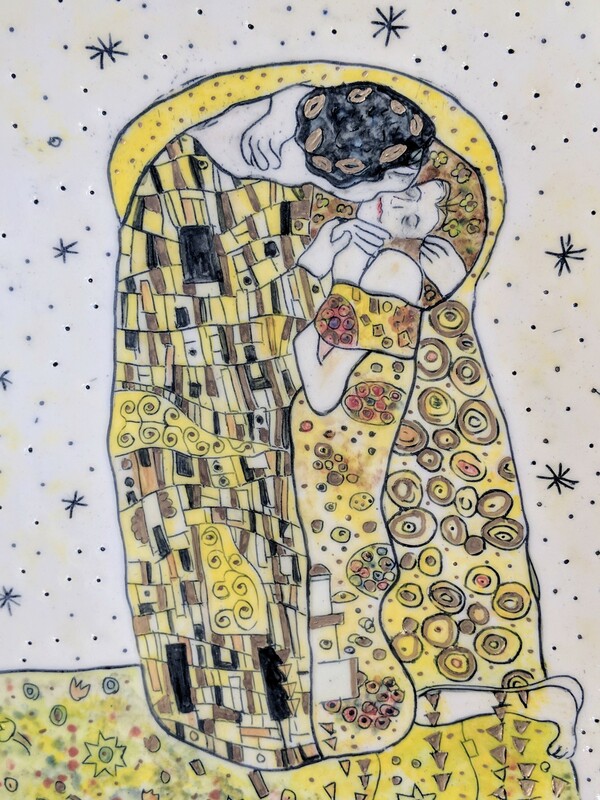 The first year I entered I interpreted Van Gogh’s Starry Night, the next year was Hokasi’s The Great Wave, and this year was Gustav Klimt’s , The Kiss…. I enjoy entering because creating my entries is a sampling of every clay surface technique I’ve learned…and I am all about the surface! 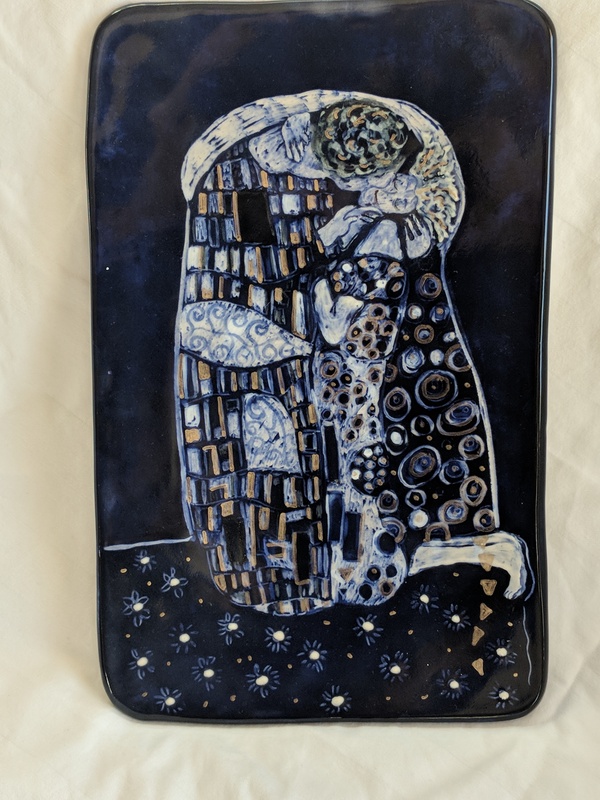 At times like this, I am glad I have a smaller kiln, as one doesn’t make one entry as you never know what a piece will look like until it comes out of the final glaze kiln. 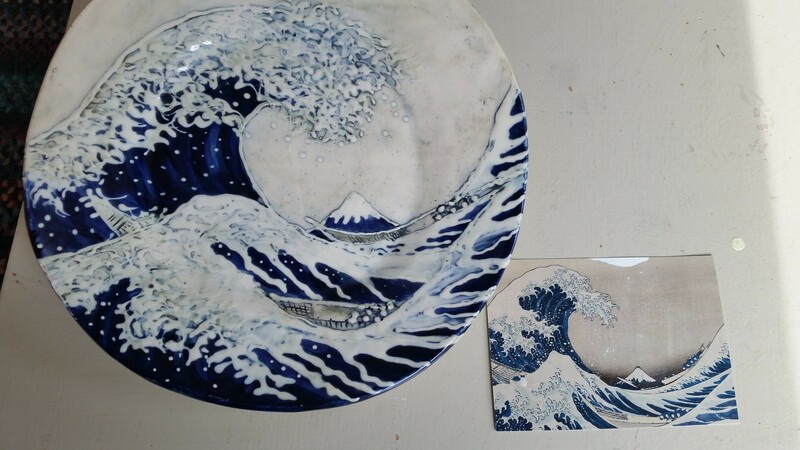 I made 5 pieces, using every surface technique I enjoy—carving, slip trailing, sgrafitto, wax resist, mishima, and then applying underglazes, washes, and glaze. In January my cellar studio by the sea is too cold and too damp to work in. Therefore, I covered the floor of my living room, set up a table near the window (ah, natural light) thus setting up a small temporary studio, with all clay, tools, and supplies needed in a warm, cozy room. I spent the week creating, relaxing, and enjoying the cold January weather on my terms. 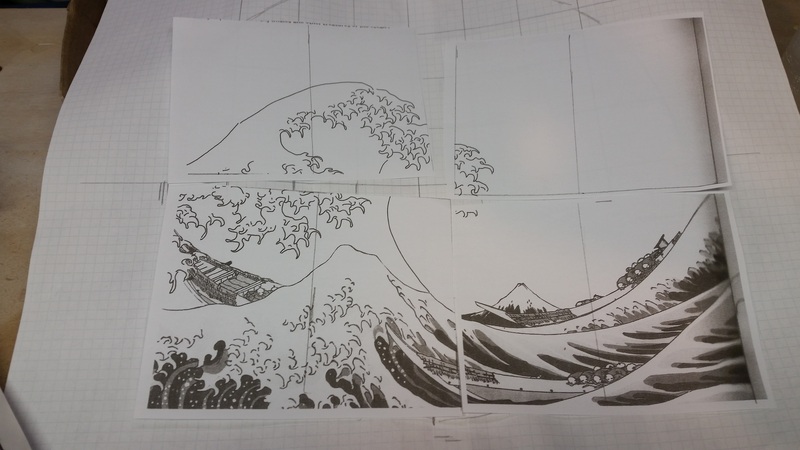 I did something that is hard to learn and hard to practice (but always pays off)…I took my time! 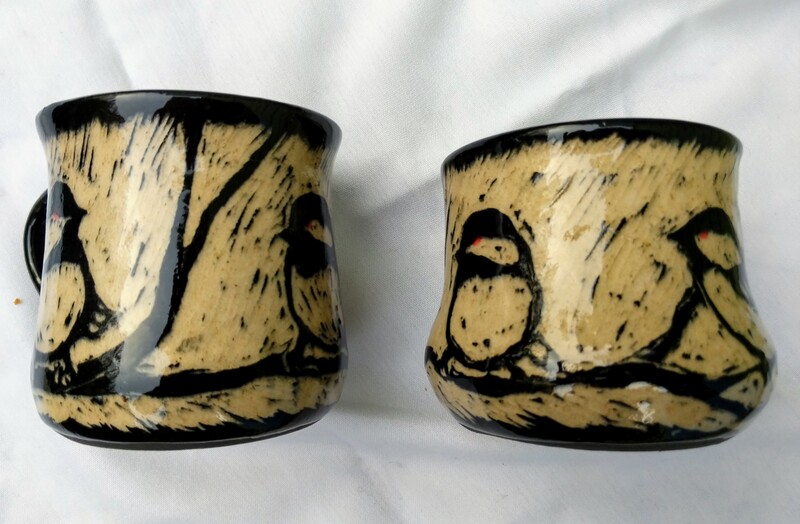 Patience is critical, you never know how something is going to turn out until it’s out of the final glaze kiln; I could only say to people “I am working on my entry….” Met with a friend when all 5 were out of the kiln to make a group decision on which piece should be entered. When the entry was finally delivered to Spring Bull Gallery, I posted my photos on social media and breathed a HUGE sigh of relief…..and then started think of next years work of art to interpret….any ideas? As a follow up, on the show opening night, my entry had a now familiar red dot, which mean I no longer owned the piece. But I do have four other interpretations if any one is interested. In a few days, our family is off to Valencia, Spain to immerse ourselves in Las Fallas, a festival which culminates in a week of fiestas, fireworks, culture, and mayhem! I’m copying a great explanation by the Don Quixote Spanish Language Learning School on a “Spain Travels” heading on my website, because it’s the most concise description I have found…. it’s hard to explain. Enjoy reading the description when you have a chance. Once in Spain, I hope to learn more about Spanish pottery and specifically the Cuerda Seca surface technique and also have a description under Spain Travels. I am wondering how 3 weeks in Spain will have an influence on my clay work; we will all find out as the year progresses! My cellar studio is not conducive to productivity in this arctic (artic?) cold. Hence, I am comfortably sitting by the fire and reflecting on this past season and, thanks to many new and old customers, thinking ahead to many more seasons. A warm feeling overcame me on Christmas Eve– I thought about all the people in the holiday season opening a gift and receiving a piece of Fat Robin Pottery vintage lace impressed pottery for the first time…It became clear it was worth every second of the long hours spent in the studio creating. The highlight of the craft shows? Watching total strangers walk up to my table/booth with a wondering look that read “give me time to think” as they looked at my wares for the first time. And a memory surfaced for them….my mother’s lace doily … and if I saw they needed help with their memory I showed them a doily….and the transformation on their face when they completed that memory and told me of a grandmother or aunt with similar lace in their possession was wonderful. One customer made the statement “you make the past come to life in your work.” And that comment hit the nail on the head…respect for the past and the women who created these doilies/lace and preserving these memories. 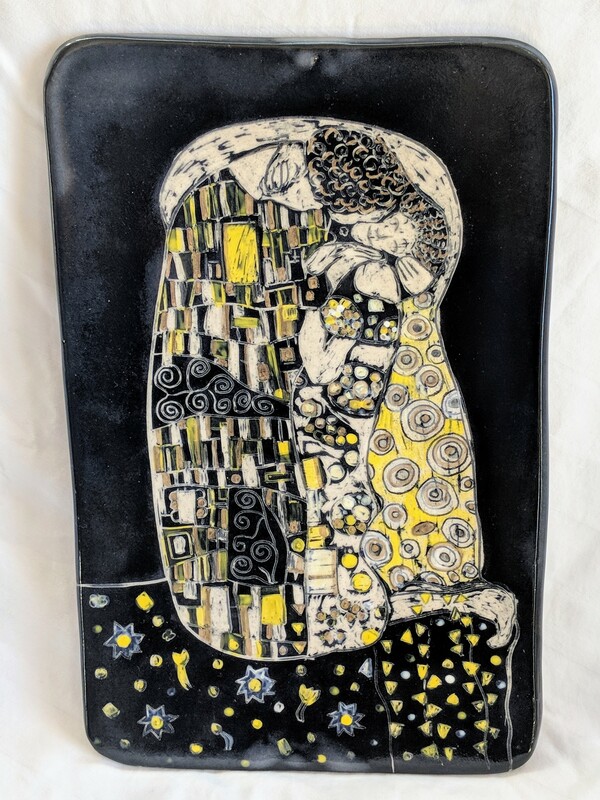 People are happy to suggest ETSY for a selling platform for my work….it won’t work for me—I can’t see the customers faces as they see my work…. And that means everything to me…. It’s my annual holiday open house this Sunday from 11:00 a.m. to 5:00 p.m., through the gate and in my garage at 26 Simmons St. in Newport….on Saturday, I will be at the Newport Hospital Auxiliary Craft Show at the Knights of Columbus Hall on Valley Rd. 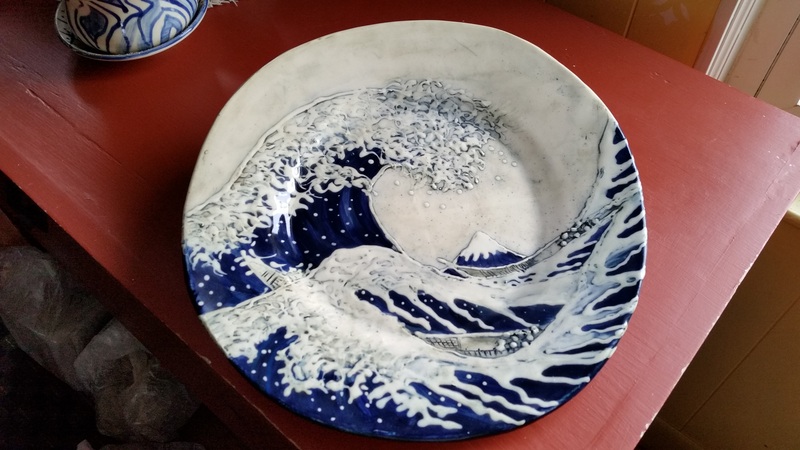 in Middletown; I then empty all the boxes and display everything I make–from vintage lace impressed pottery to raku to pit fire to sgrafitto on mugs, bowls, ornaments, plates, and more–a years worth of playing in clay and you can see it all! My last selling event is the Newport Art Museum Faculty and Student show and I’m still working on surprises for that fair. As usual, park creatively on Simmons St. or park elsewhere and take a walk and see all the sights along lower Thames St.
Can’t make it? Email or call to set up an appointment on another day….I’ll have the tea water ready! After many months of work, it’s Showtime! 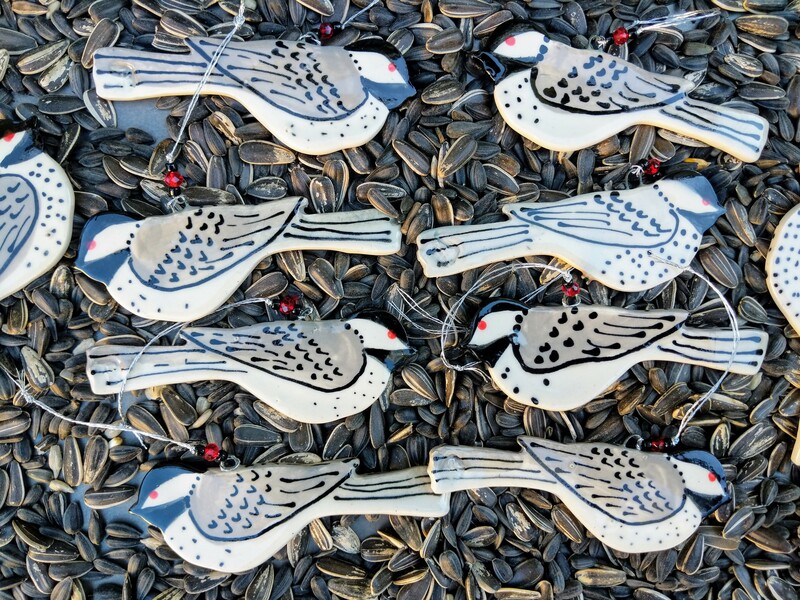 After months of learning, thinking, practicing, tweaking, exploring, traveling, wondering, and creating, it’s ready or not, the holiday fair season is upon us, starting with the Unique Boutique at Easton’s Beach in Newport. 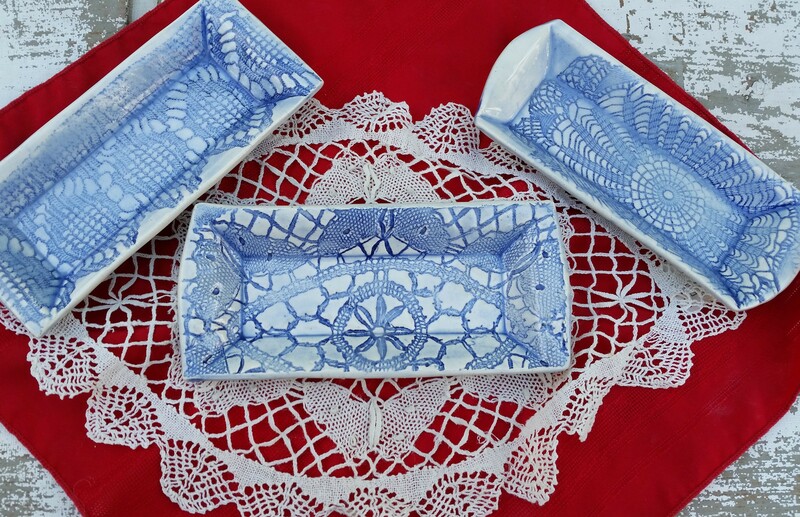 Along with my new “a day at the beach” ornaments (scallop, starfish, quahog), there are more lace inspired table serving pieces, great for any holiday table. 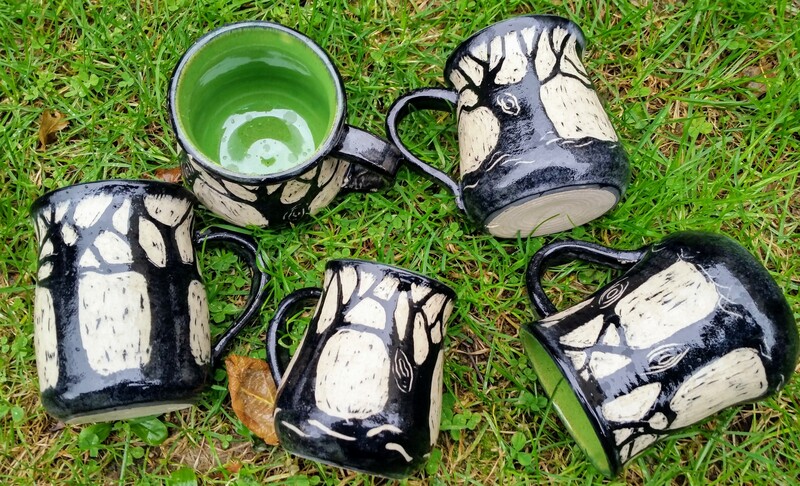 Looking forward to pleasing current Fat Robin fans and to delighting new pottery users! 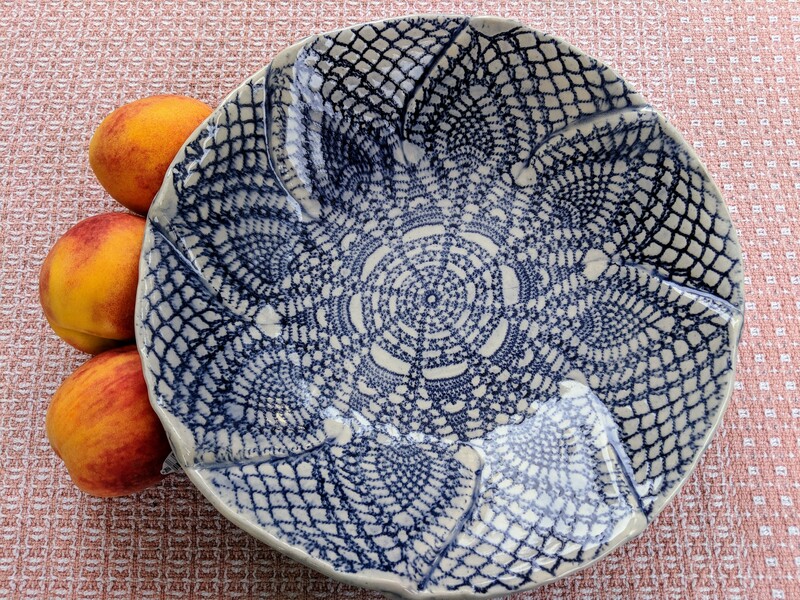 This pottery is made to be used and to become your new favorite! Looking ahead, I will have a table at the Pop Up Sale at the Hibernian Hall, Wellington Ave, Newport on Saturday, Nov. 18 and at the Newport Hospital Auxiliary Fair on Saturday, Dec. 2 at the Knights of Columbus Hall on Valley Rd. 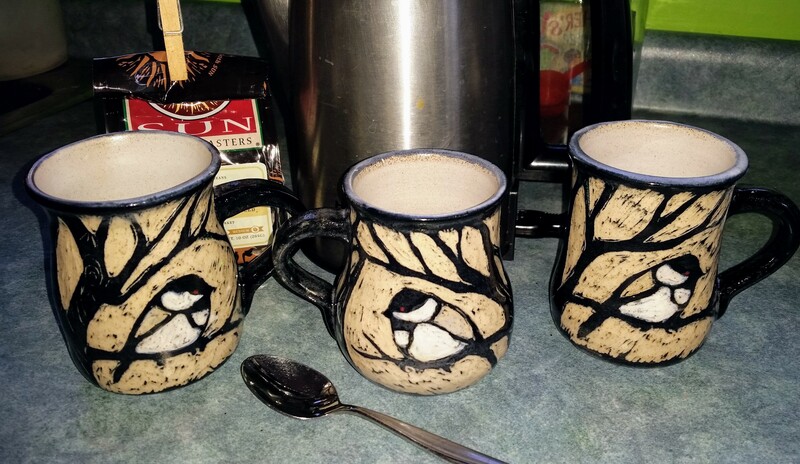 in Middletown…..Sunday, Dec. 3 all are invited to the Fat Robin Pottery Holiday Open House…..it’s that time of year! Happy Holidays! Change is in the air…. This has been a summer of transition on the home front, as a daughter moved into her own home leaving an empty bedroom…. 2 empty bedrooms to be exact, which then involved painting, and that cleaning fervor led to other rooms. 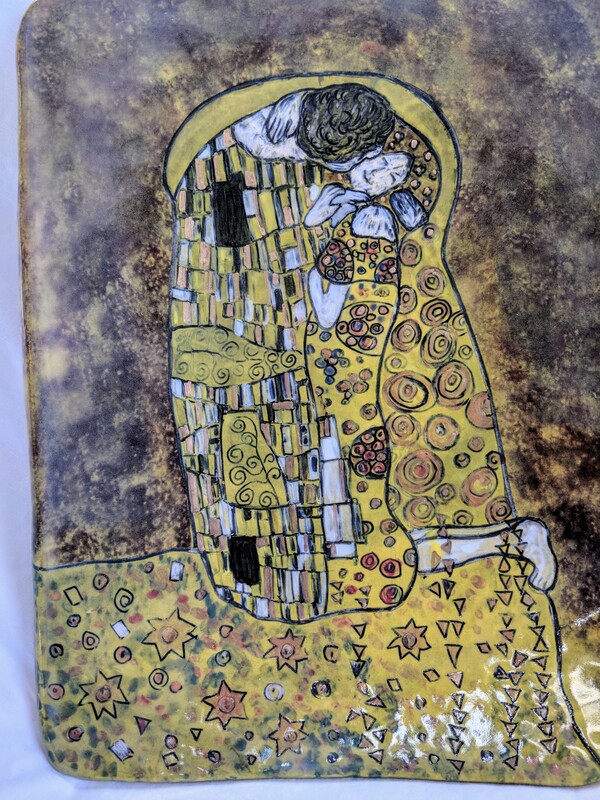 Much time was spent sorting old paper, possessions, books, emptying boxes in all rooms of the house and reliving memories for my husband and I….it was time well spent. In one old file was my job resume from the late 1970’s. Since then I have had many jobs and raised children, so I strayed far from that original resume…. 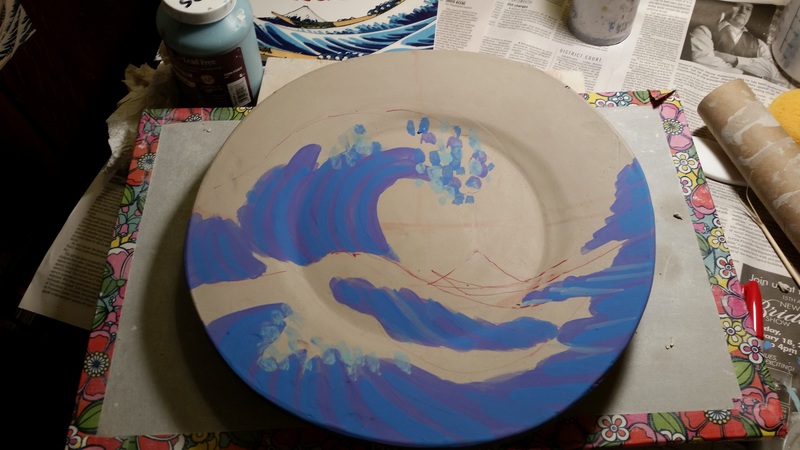 the best part of reading that resume was my objective …”to design, develop and manage my own business using personal skills and the talents and creativity of fellow craftspeople and artists…” I didn’t even know clay existed back then! But all my jobs, life experiences, travel, people connections, in the interim have brought me back to my original objective…..it only took 30 years plus to bring me full circle to my original intentions! Looking forward to many more revelations in the coming year…. The sun is shining! Happy June 1! A lot has transpired the past few months while I was in hibernation…. 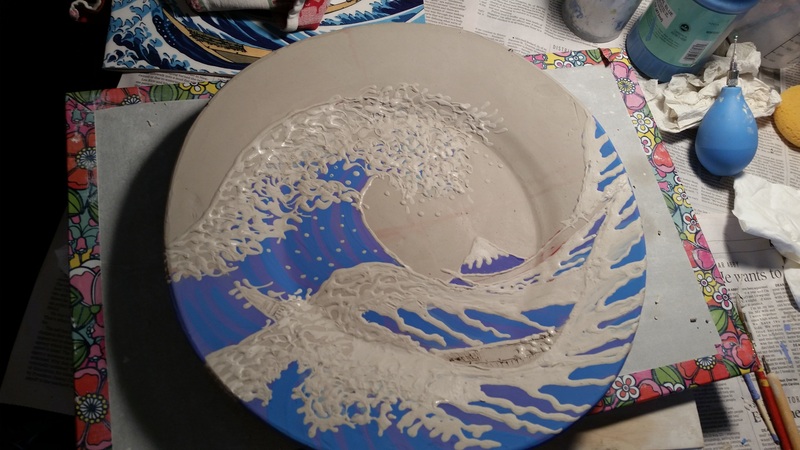 With the kiln in winter mode, the cold months were a time for a fun project-the annual Fakes and Forgeries show at Spring Bull Gallery in Newport…my entry was a clay replica of “The Great Wave” by Mr. Hokusai After the show opening, I noticed a red dot and a lovely gray “most original” ribbon on my piece…happy clay lady. March was my annual MN visit for quality mother/daughter time….and a chance to shop antique malls for vintage lace (happily I hit the mother lode!) March also began my enrollment in a class at South County Art Association taught by the clay hand building guru of RI, Anna Highsmith.. Perfecting techniques, exploring, learning, practicing, and playing gave me a change to create new forms and strengthen previous designs, all perfect for vintage lace imprint….very happy with new shapes and ideas…. Which brings me to June! 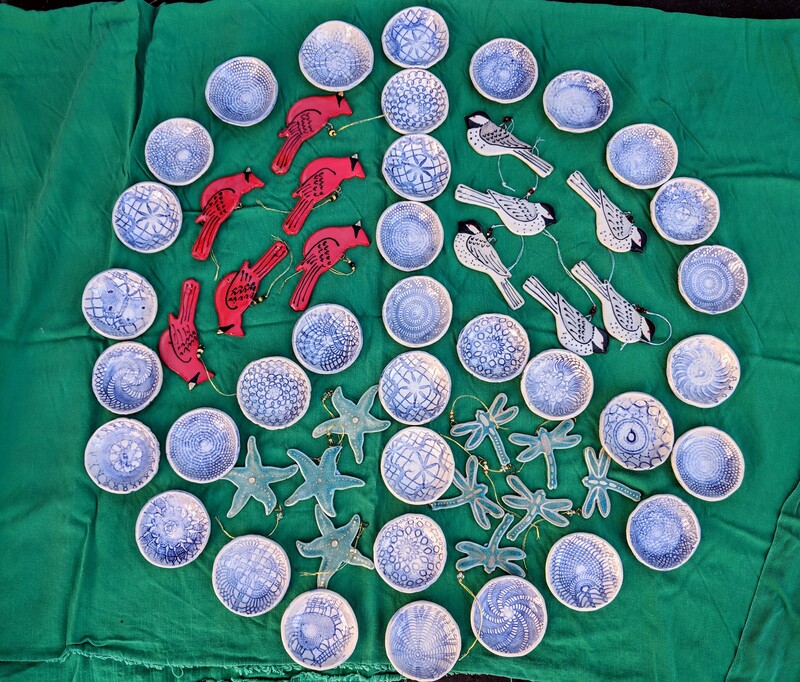 June finds me cleaning, purging, and getting ready for my summer production mode of pottery for fairs this fall…. 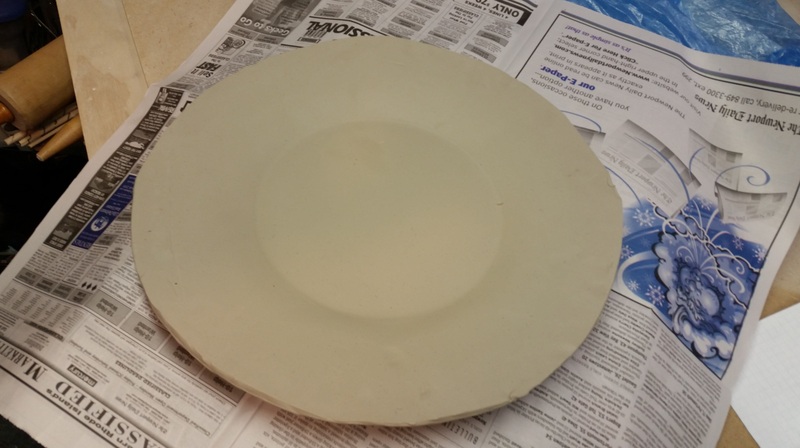 I will have a table of test pieces, seconds, and other items that need a new home, (i.e. 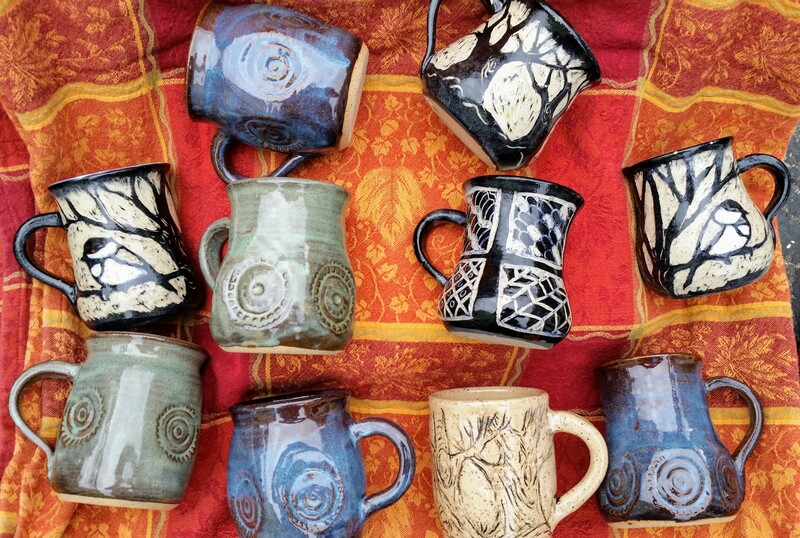 yours) at the Community yard, art, and craft sale at the Portsmouth Arts Guild , Saturday, June 10 from 9 to 3…. 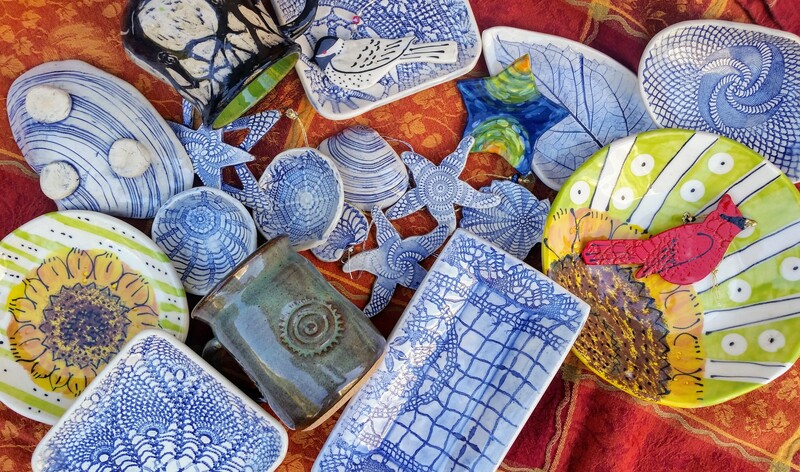 All part of my clay cycle–making room for new clay fun and inventory….enjoy this sunshine! 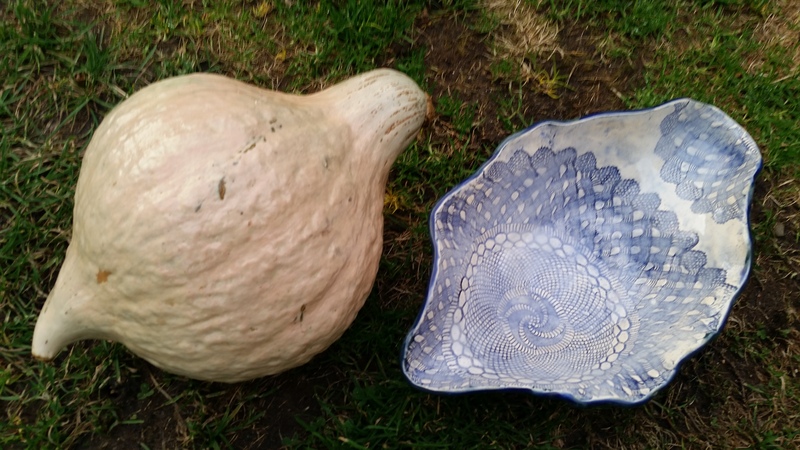 The Spring Bull Gallery in Newport’s upcoming show is The Art of Food – the perfect venue for my hubbard squash bowls….fortunately, I was able to purchase the last hubbard squash of the season at DeCastro’s Farm Stand in Portsmouth. 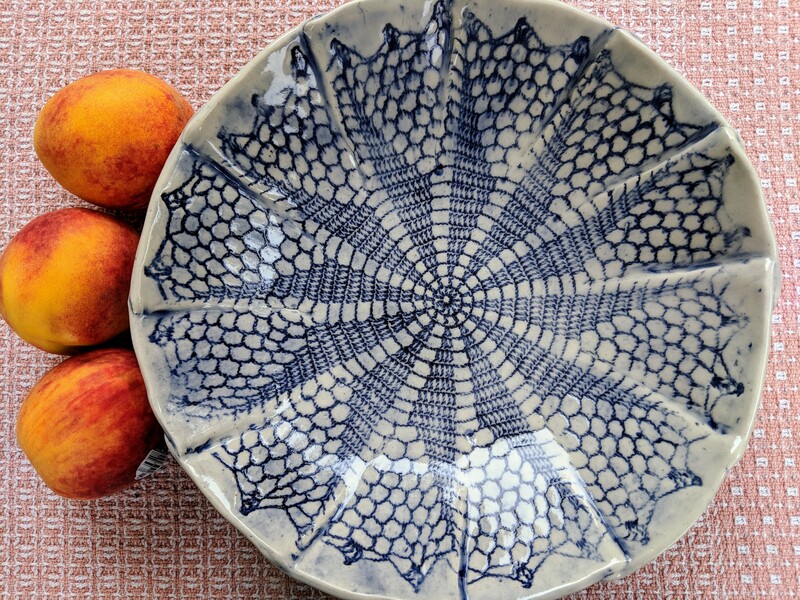 This squash bowl edition of mine combines my love of vintage lace on clay, draped over a hubbard squash; this leaves a great lace impression on the inside of the bowl, and the nubbly squash texture with organic glaze qualities on the outside of the bowl. After all these years, I am so relieved there is no hungry senior citizen with her hungry dog! But to fuel your art hunger, there is a great show, the Art of Food, at Spring Bull Gallery in Newport. I stand corrected (it’s okay—I’m a lifelong learner!) 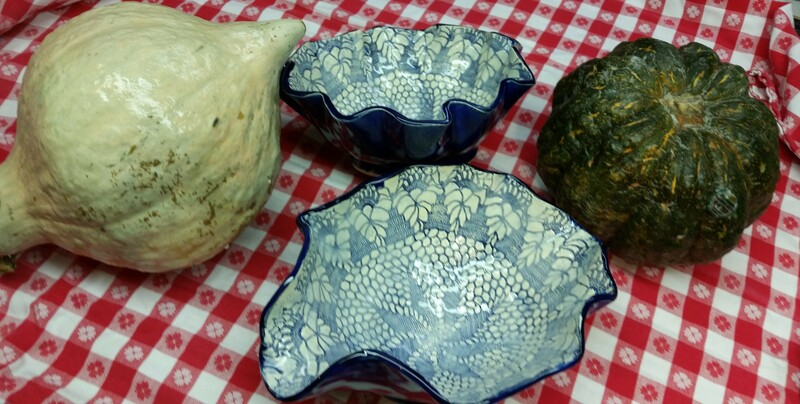 A longtime customer politely pointed out to me that the shells I use to mold what I am calling my “quahog” dishes, are really sea clams, not quahogs. 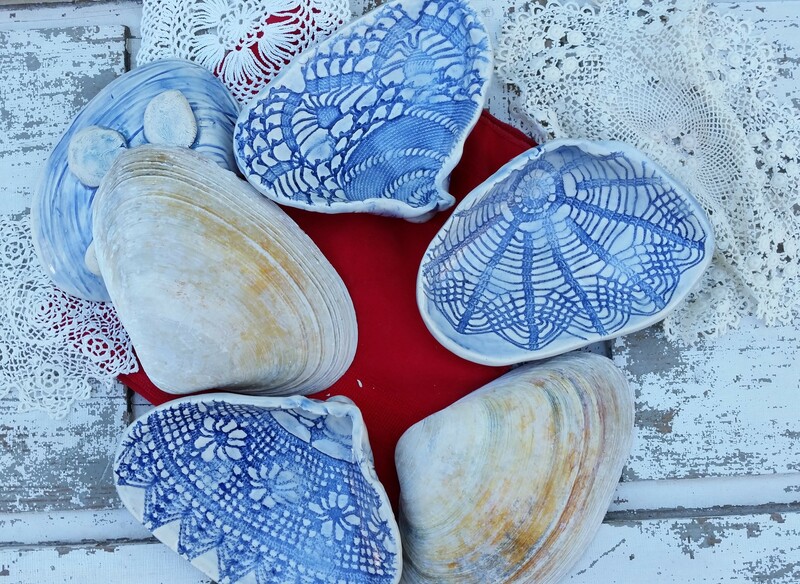 Sea clams are large, and quahogs are smaller and lined with the shades of purple..Therefore, I would like to inform my customers that I have an ample supply of Vintage Lace Impressed Sea Clam (formerly quahog) dishes if you need a gift for any homesick, currently out of state Rhode Islanders! 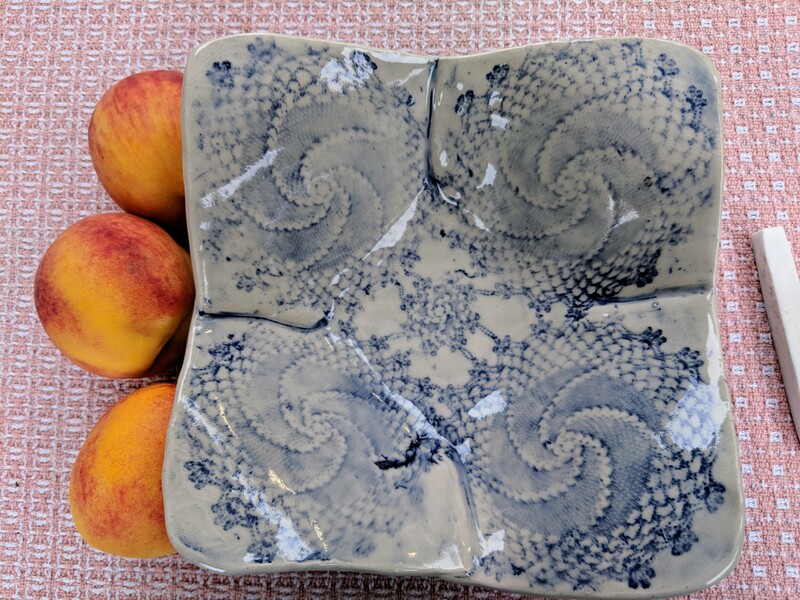 Many thanks to all who stopped by at the recent Fat Robin Pottery open house….the pottery display will remain set up in my garage for the next few weeks; if you’d like to stop by to shop—just get in touch! 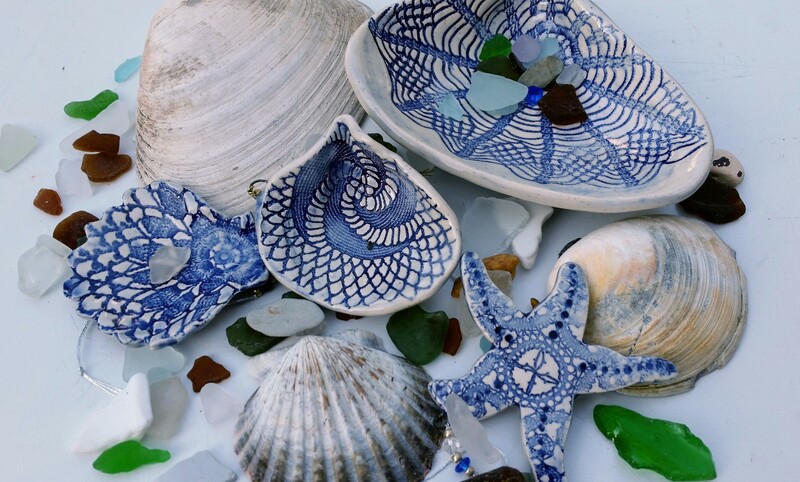 Happy to offer a wide selection of lace inspired pottery, ornaments, pit fired pots and votives, mugs, bowls, and other one of a kind items…..
“As we struggle with shopping lists and invitations, compounded by December’s bad weather, it is good to be reminded that there are people in our lives who are worth this aggravation, and people to whom we are worth the same.” ( – Donald E. Westlake) Best Wishes!